My walk to work is just under 1.5 miles, it takes me between 15 and 25 minutes (depending how late/tired/laden down with bags I am) and burns a depressingly low number of calories I know this because I worked it out. One way is not even half a twix. How awful is that? I walk in pretty much every day, unless I have a meeting at an out of town site walking just seems like the sensible option - driving costs me a fortune in parking and it's actually quicker to walk than get the bus! When I lived in Leeds city centre I'd walk to work, but for the last 5 years I've had to bus or car in to work, so now, even after 7 months, the novelty of being able to walk to work hasn't worn off. The route isn't pretty, it's mostly houses and concrete, and Monday mornings mean a stop at Waitrose for fruit for the office and dilute juice. Luckily, the stop coincided with a torrential downpour so it served as an excuse to get out of the rain! But who ever picked this as walk to work week should've thought about it better and maybe planned it for July. Seriously, if this was my first day of walking it'd have put me off - I even had to dry my trainers under the hand dryer! 1.5 miles is not too bad - that is 3 miles a day or 15 miles a week! 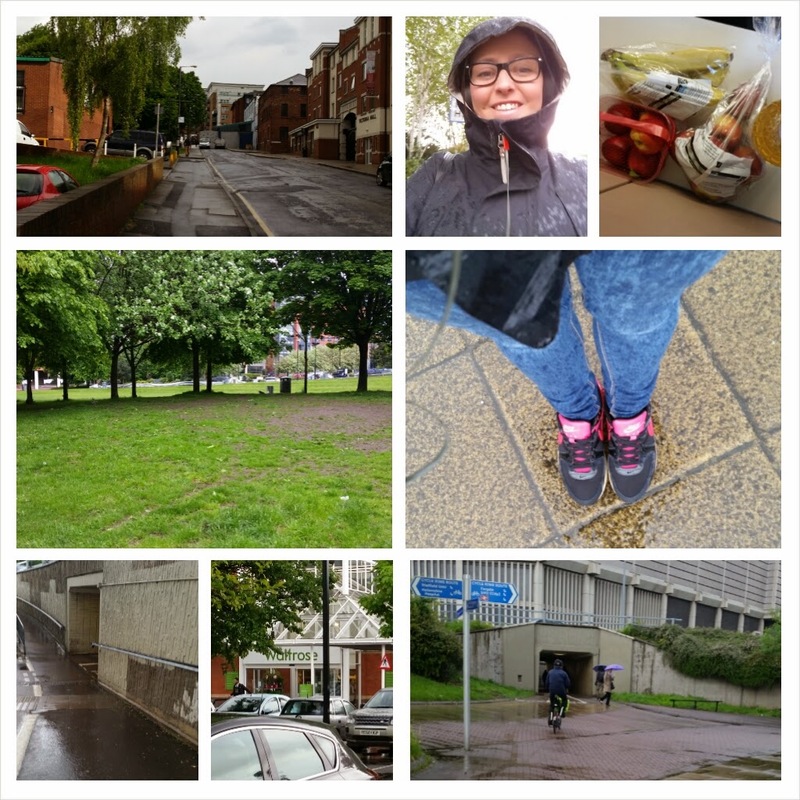 At the moment my walk is 2.5-3 miles depending on which office I am in and so far I have missed the worst of the rain but I am sure I will get drenched at some point! I'd never thought about it like that. That's got to earn me a few more treats a week! 2.5-3 miles is a pretty good morning walk isn't it. Is it a scenic route? Parking costs are ridiculous! I wish I could walk all the way to work as a brisk walk is so good in the morning. Not so much when it's wet though! They are totally ridiculous! It's between £5-8 per day which seems too much when it's free to walk! Usually the rain isn't that bad but Monday it soaked me!